Following drills in the Yellow Sea and South China Sea, the Chinese People’s Liberation Army Navy conducted anti-missile drills in the East China Sea over the weekend. The drills were reportedly designed to counter potential missile threats from US, Japan, and other potential combatants. The exercises come on the heels of an exercise in which the US, Japan, and Australia practiced sinking a ship into the sea with missiles fired from land, air, and sea. The exercise showed how a conflict with the Chinese Navy might play out. 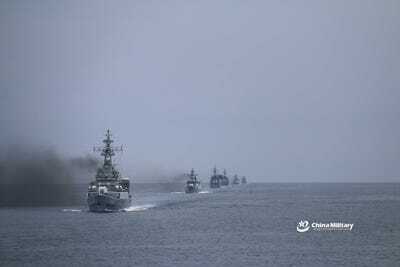 Chinese People’s Liberation Army Navy ships drilled in the East China Sea over the weekend, practicing honing its skills and countering missile threats from rivals like Japan, the US, and other potential combatants. More than 10 naval vessels from three different command theatres participated in an air-defence and anti-missile live-fire exercise on Saturday, according to Chinese media reports. “Intercepting anti-ship missiles is an urgent task as the surrounding threats grow,” Chinese military expert Song Zhongping told Global Times, specifically referring to the potential threats posed by the US, Japan, and other countries that engage in military activities near China. “Anti-missile capability is indispensable to building a fully functional strategic PLA Navy. Such exercises are aimed at ensuring the PLA is prepared for battles,” the expert explained. During the drills, the Meizhou, a Type 056 corvette with the South Sea Fleet armed with both anti-ship and surface-to-air missiles, gunned down an incoming anti-ship missile, according to Asia Times. The Tongren, another ship of the same class with East Sea Fleet, reportedly missed a missile on purpose to demonstrate the ability to follow with a successful second shot. The drill comes on the heels of two other naval drills in the Yellow Sea and South China Sea. China’s naval exercises appear to be, at least in part, a response to part of the most recent iteration of the Rim of the Pacific maritime drills. On July 12, aircraft, submarines, and land-based missile systems manned by US, Australian, and Japanese military personnel opened fire on the former USS Racine, a decommissioned ship used for target practice during the sinking exercise. For the “first time in history,” Japanese missiles under US fire control were used to target a ship and sink it into the sea. China is actively trying to bolster the combat capability of its naval force, the largest in the world today. China is producing new aircraft carriers, as well as heavy cruisers to defend them. China’s growing power is becoming more evident as it attempts to flex its muscles in disputed seas, such as the East and South China Sea. The sinking exercise during RIMPAC “demonstrated the lethality and adaptability of our joint forces,” US Indo-Pacific Command chief Adm. Phil Davidson said of the drill in a statement published on Facebook. In response to Chinese drills in the East China Sea, where China and Japan often feud over the contested Senkaku/Diaoyu Islands, Japan will deploy an elite marine unit for drills before the end of the year. The Amphibious Rapid Deployment Brigade, which has not been in service since World War II, was reactivated in March to counter potential Chinese threats to Japanese territory,according to Taiwan News.